Ua kālele ko ke Kulanui o Hawai‘i-Hilo hakulau a kūkulu ‘ana i ka hale hou o ke Koleke ‘Ōlelo Hawai‘i ma luna o nā ‘ano e ho‘ēmi ai i ka ho‘opohō ‘ana i nā kumuwaiwai kūlohelohe e pono ai ke kaiapuni hana no nā haumāna a me nā limahana o ka hale. I mea ho‘i e pa‘a mai ai kēia mau pahuhopu, ke ‘imi ‘ia nei ka hō‘oia ‘ana mai ma ka ho‘ohana ‘ana i ke Ana ‘Ōnaehana Hale ‘Ōma‘omaʻo LEED-NC 2009 o ka U.S. Green Building Council (USGBC). No LEED ke kahua hana nāna e hō‘oia i ka ho‘ononiakahi ‘ana i ke ka‘inahana hakulau a kūkulu i māuna ‘ole ai ka ho‘ohana kumuwaiwai ‘ana i pa‘a he ‘ōnaehana makauli‘i e lōkahi pū ai me ko ke kaiaulu, a me ka mālama ‘ana i ka ‘olu‘olu a me ke olakino o nā kānaka noho hale. Ke nānā nei ko ka papahana kime i ke kūlana hō‘oia, he Hō‘oia Kula. From project initiation, the University of Hawai‘i at Hilo aimed to design and construct Hale‘ōlelo for Ka Haka ‘Ula O Ke‘elikōlani (KHUOK) College of Hawaiian Language to significantly reduce its impact on natural resources, maximize efficiency, and create a high-quality work environment for students and staff. To assist in meeting these goals, the project is seeking certification using the LEED-NC 2009 Green Building Rating System of the U.S. Green Building Council (USGBC). LEED represents a framework for ensuring an integrated design and construction process that enhances resource efficiency, waste reduction, community connectivity, and occupant health and comfort. The project team is targeting a Gold certification. Hoihoi paha ʻoe e ʻike i ka nani o Haleʻōlelo a e aʻo no ka nui o ka noʻonoʻo ʻana i ka mālama honua a me ka mālama ikehu ʻana ma loko o ka papahana LEED? E kaomi ma ʻaneʻi no ka ʻikepili Kipa LEED. Are you interested in seeing beautiful Haleʻōlelo and learning more about how we care for our resources and energy within the LEED program? Click here to find out more about visiting us and taking a LEED Tour. Ho‘okele ‘a‘aiawā ‘ia e ho‘ēmi ai i ka ho‘ohaumia ‘ana ma nā hana kūkulu ma ka ho‘ohana ‘ana i ka Best Management Practices (BMPs). Paipai ‘ia kekahi mau koho alakau ma ke kūkulu ‘ana he mau kūna ka‘a‘ōhua, kekahi wahi kūkulu paikikala, a me kekahi mau lumi ho‘ololi lole no ka po‘e ka‘ahele. Ho‘ēmi ‘ia ka nui o nā wahi ho‘okū ka‘a a ho‘olako ‘ia nā limahana me nā wahi ho‘okū ka‘a kūikawā no nā ka‘a ho‘omakauli‘i ikehu. Ho‘okele pono ‘ia ka nui a me ke ahuana o ka wai ua kahe e emi ai ka hō‘ino‘ino ‘ia o ke kahua hale a me nā wahi ma kai aku. Effectively controlling erosion and sediment to limit the potential for pollution from construction activity through the implementation of Best Management Practices (BMPs). Encouraging the use of alternative modes of transportation by providing bicycle parking spaces and changing rooms for commuters. Minimizing the number parking spaces provided for the project and providing preferred parking spaces for low-emitting and fuel-efficient vehicles. Effectively managing stormwater quality and quantity on the building site to maximize infiltration and reduce downstream impacts. Ho‘ēmi nui ‘ia ka ho‘ohana ‘ana i ka wai inu o loko o ka hale ma ke 40% ma muli o ka ‘enehana a me nā kī wai mālama wai. Koho ‘ia he mau meakanu ‘ōiwi nona kekahi waiwai mo‘omeheu no ka pā hale e kūpono ai me ke aniau a i koi ‘ole ‘ia ai he ‘ōnaehana ho‘opulu wai. Significantly reducing interior potable water use, including a reduction in water demand of more than 40% through low-flow fixtures and faucets. Planting native and culturally-significant vegetation throughout the site to effectively respond to the climate, thereby requiring no permanent irrigation. Hō‘aelike ‘ia nā ‘ōnaehana kūkulu e hō‘oia ai i ka ho‘oholo māuna ‘ole ‘ana o ka ʻōnaehana hoʻomehana, hoʻomāʻamaʻama, a hōʻoluea (HVAC) o ka hale. Ho‘okomo ‘ia ka HVAC hō‘uha‘uha ‘ole e emi kūpono ai ka lilo ʻana o ka ikehu ma ka hale. Ho‘ēmi ‘ia ke koina ikehu ma kahi o ke 30% ma lalo o ke kumu koina ho‘ohana ikehu o ka pāhana. Ho‘olako ‘ia 3% a ‘oi o ko ka hale koina ikehu o ka makahiki ma muli o nā papa ‘ūomo ikehu lā. Commissioning building systems to ensure the most efficient operation of lighting and heating, ventilation, and air conditioning (HVAC) systems. Installing a high-efficiency HVAC system to optimize the building’s energy performance, reducing the building’s energy demand by approximately 30% as compared to the baseline performance. Installing a photovoltaic array which will generate over 3% of the building’s annual energy demand. Ho‘ononiakahi ‘ia nā makelia i hoʻopōʻaiapuni hapa ʻia, i hoʻopōʻaiapuni ʻē ʻia he 20% o nā makelia o ka hale. Ho‘ohana ‘ia ka papa lā‘au i ‘āpono ‘ia e ko ka FSC (Forest Stewardship Council) no 50% o nā lako lā‘au. Incorporating materials with recycled content, yielding a total of over 20% recycled content for all materials used. Using FSC (Forest Stewardship Council) certified wood for over 50% of all wood products. He mau ki‘ina e hō‘oi ai i ke ahuana maika‘i o loko o ka hale e like me ke kāohi ‘ana i ke pena a me nā mea hamo ho‘ohaumia, a me ka pāpā ‘ia o ke puhi paka ma loko a ma ha‘i o ka hale. Ho‘okele pono ‘ia ke ahuana o ke ea o loko o ka hale ma ka wā kūkulu a ma mua o ka noho ‘ia ‘ana o ka hale. Ho‘oponopono ‘ia ka loa‘a o ke ea no waho ma ke ana ‘ia o ke kalapona diokesaside (CO2) a me ka hō‘oia i ka palena li‘ili‘i o ka lākiō ea no waho ma ka ‘ōnaehana HVAC. 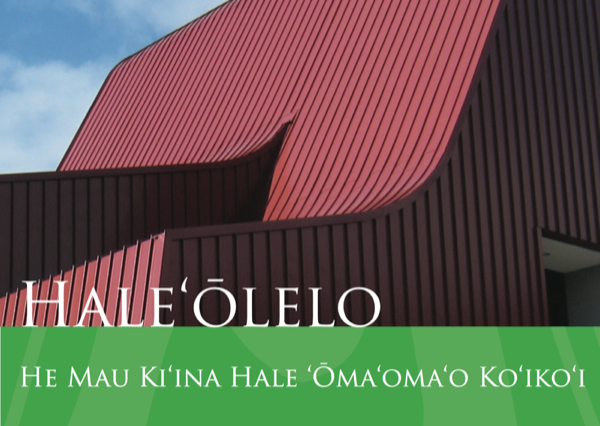 He ‘enehana ho‘okele ikehu kūpono no ka ʻōnaehana hoʻomāʻamaʻama a HVAC hoʻi o loko o ka hale. He ‘ōnaehana ho‘oma‘ema‘e hale ‘ōma‘oma‘o me ka ho‘ohui pū ‘ia o ke kāohi haipilikia e emi ai ka lā‘au ‘ino‘ino ma ka noho ʻia ʻana o ka hale. Incorporating a range of strategies to improve indoor air quality, including specifying low-emitting paints and coatings and prohibiting smoking in and around the building. Effectively managing indoor air quality throughout construction activities and prior to occupancy. Increasing access to outside air by monitoring carbon dioxide (CO2) and ensuring minimum outside air rates in the HVAC system. Maximizing controllability of lighting and HVAC systems throughout the building. Implementing green housekeeping and integrated pest management programs to reduce exposure to toxins during occupancy. E holo mai a mākaʻikaʻi ma kā mākou Kipa LEED! Come take a LEED tour of the building!